Out of breath, sweat pouring down my face and my legs trembling from the weight of my pack. Was this really how I wanted to be when taking photos in the wilderness? ‘Surely there’s an easier way’ I thought to myself as I pushed on towards the summit. It’s hard to know what drives you in situations like these, I guess it’s the fear of failure, or returning back to the office with only mediocre images after so much effort. This trip was meant to be an experience. It would be the first multi-day hike I’d done on my own and I knew what I was taking on, yet in the back of my mind I had my doubts about what I could achieve. In hindsight I could have done more preparation, read more trip reports, studied more maps or even been much fitter but I have always been more of a ‘dooer’. Sitting in my office spending hours reading articles and scanning over google earth can, at times, frustrate me. When I’m alone I would rather be out exploring, finding my own way, discovering something new. Is that not the way real adventures should be? 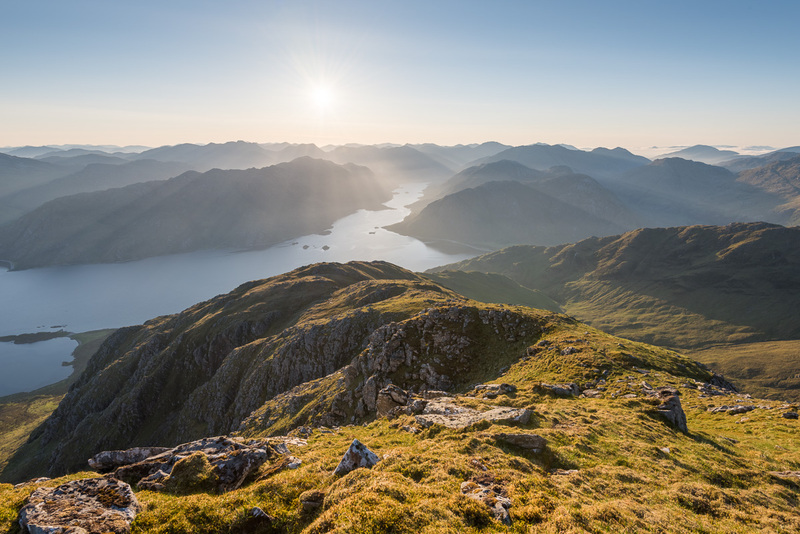 Knoydart is a peninsula on the west coast of Scotland and is known as ‘Britain’s Last Wilderness’. 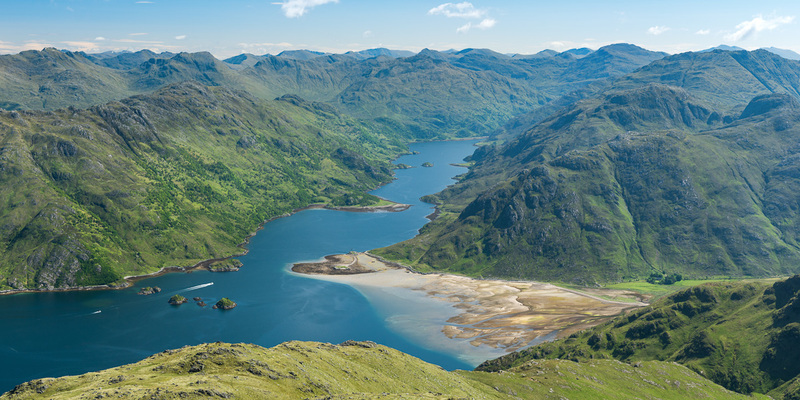 Only accessible by boat or by foot it is an unspoilt corner of Scotland that I have been wanting to visit for years. 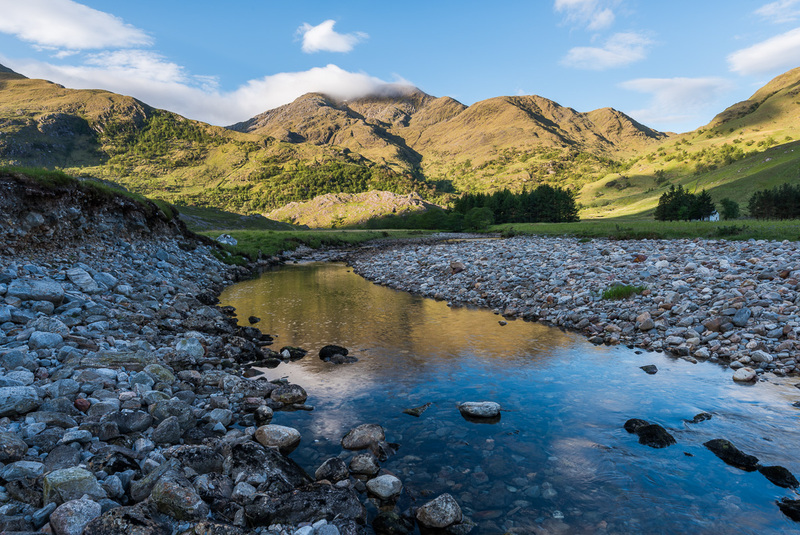 It is also home to Ladhar Bheinn, the most westerly and one of the remotest munros on the Scottish mainland. I climbed into my tent as dusk settled and it quickly dawned on me that I would be up for sunrise again in less than 4 hours. At these latitudes in mid summer the skies never really get dark so I knew sleep would be a precious commodity during this trip. The view, however, was stunning and everything I hoped it would be. Even with the clear skies the visibility was excellent and I could see so many peaks around the highlands including the snow capped Ben Nevis to the South East. I could also get a perfect view of my intended route. An overview of the area always helps to put everything into perspective and show the lay of the land. After sunrise I made a quick call to my girlfriend to get an update of the mountain weather forecast. Unfortunately strong winds and low cloud where forecast for the end of the following day so my only chance of getting to the summit of Ladhar Bhienn to photograph sunrise was by the end of the day. I made the descent back to sea level, briefly stopping at the B&B for a cup of coffee and a chat with the owner about the route. I repacked my bag throwing in everything in I thought i’d need for a few days away. Including all my camera and time-lapse equipment. It was quite a weight, around 29kg (including 2l of water) and so shouldering my bag I took off along the well known coastal path towards Barrisdale. The route is beautiful but the only thing on my mind was the heat. Without a cloud in the sky, it was sweltering. The secluded walk offered little respite, with hardly a breath of wind. After around 3 hours, I stopped on a footbridge under the shade of a tree for lunch. It was already 3.30pm but I was confident I would be able to complete the walk in time for sunset. 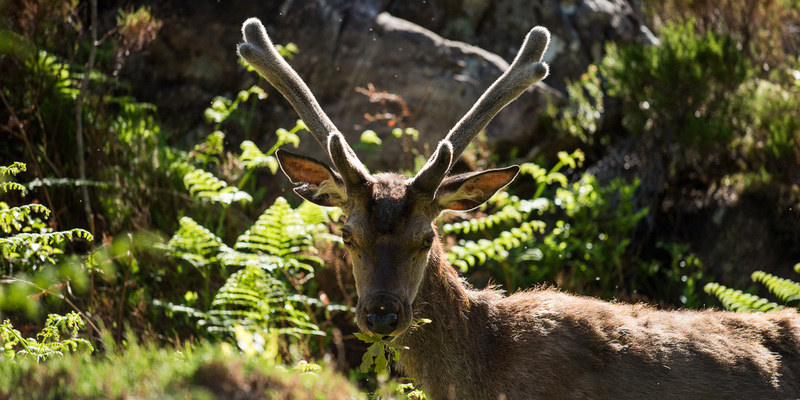 ‘What?’ Roe deer have become a real nuisance in these areas as they are incredibly destructive to the flora. 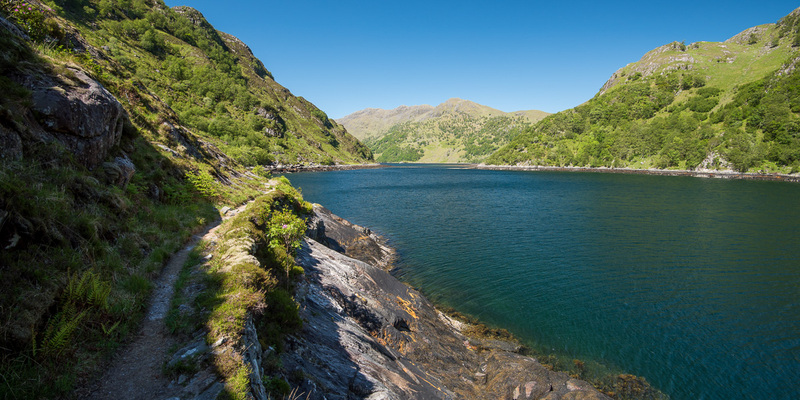 I pushed onto Barrisdale taking a few images of the crystal blue waters of Loch Hourn along the way. 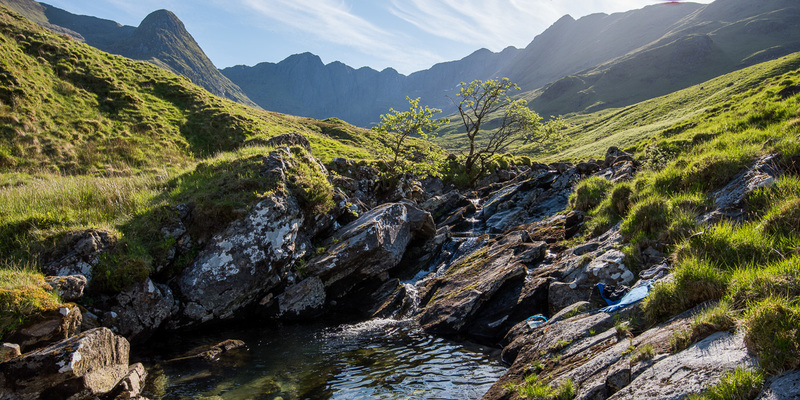 The coastal route proved to be harder than I thought as it includes a total climb of 600 meters as it undulates its way along the loch, fortunately there are various streams along the route to source water, which I was getting through by the bucket load! The white sands and turquoise waters of Barrisdale Bay looked so inviting in this heat! 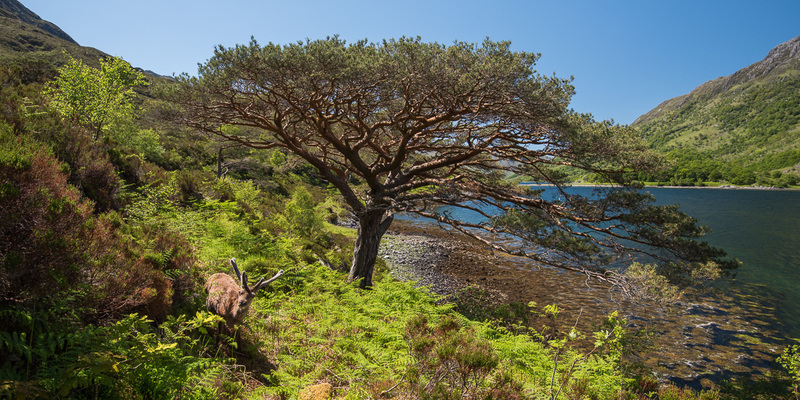 I decided to take the route around the north of the mountain and keep to the side of the loch as I knew there were a number of photographic opportunities en-route. At around 5pm I finally began the 1000m ascent up the most remote of munros but the heat and strong sunlight had taken it’s toll. I was dehydrated and feeling a little uneasy so I decided to stop for a break. Adventures like these can’t always be focussed on photography. The enjoyment of the outdoors and hiking plays such a vital part to my motivation, especially somewhere as beautiful as this. However, from time to time it’s easy to forget the simple pleasures, especially on this occasion, when I had packed my backpack to the brim and pushed myself to the limit. Fortunately I found a shallow pool along a stream from the mountain and took a dip to cool off and gulped down at least 2 liters of water within seconds. A memorable place to stop for a well earned dip. Feeling much better I continued up the flanks of the mountain but I lost the path almost immediately. This is pretty normal in Knoydart as the ground is so rough in places and the footfall is much lower than other Scottish munros. With the sun setting and shadows lengthening I couldn’t help feel frustrated that I was still hiking. 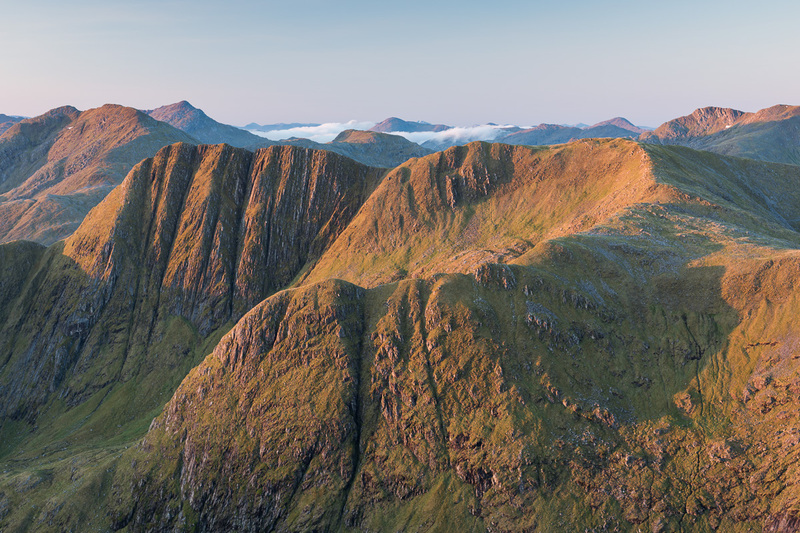 I reached the top of Stob a’ Choire Odhair just as the sun set over the Isle of Skye to the east. I was still almost a km away from the 1020 meter summit but I had found a perfect camp spot at 900 meters. The view was incredible. 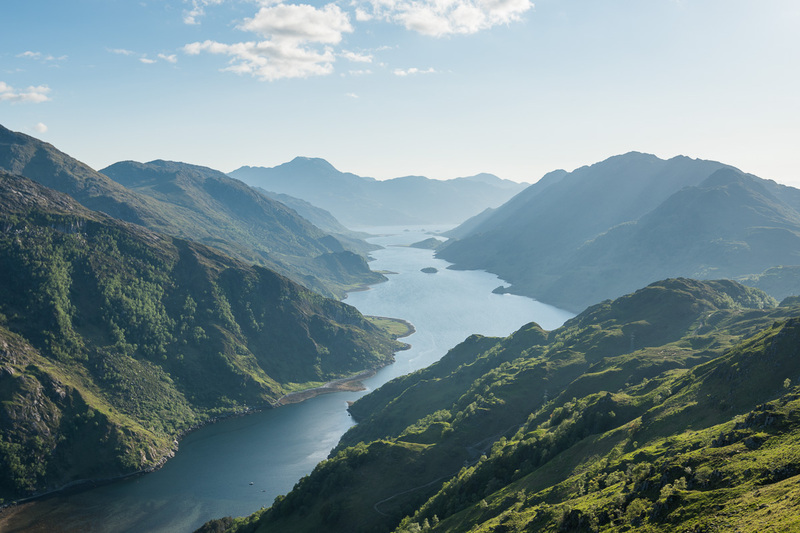 With a full panoramic view of Loch Hourn and the surrounding mountains it was everything I hoped it would be. I had been pretty much on the move since 9am and had hiked over 13 miles with over a mile of ascent and nearly a mile of decent so as you can imagine I was pretty exhausted! It was by far the hardest hikes I’d ever done but I was so relieved to have made it. The night’s camp was a peaceful one but at 3.30am, as sunrise approached, I was up again, bleary eyed and legs full of cramp. It was a beautiful clear morning and there was a slight haze in the air, which helped to give some interest as the sun rose. I clambered back into the tent and tried to get some more sleep as the strong sunlight began to heat everything up again. I finally got up around 10am and was surprised to see a hiker walking past the tent. Having walked in the same route I struggled so much along the day before and he was set to summit the mountain and be back before tea. I guess that brought it into perspective that how much weight can slow you down especially in terrain like this. He did take one glance at all my equipment and looked at me like I was a little mad. I suppose it’s the passion for my images and film work that drive me to places like these, even if I do have to carry it all on my back. ‘The big squeeze’ Having lightweight and compact camping equipment is essential for making sure everything can fit in your pack! 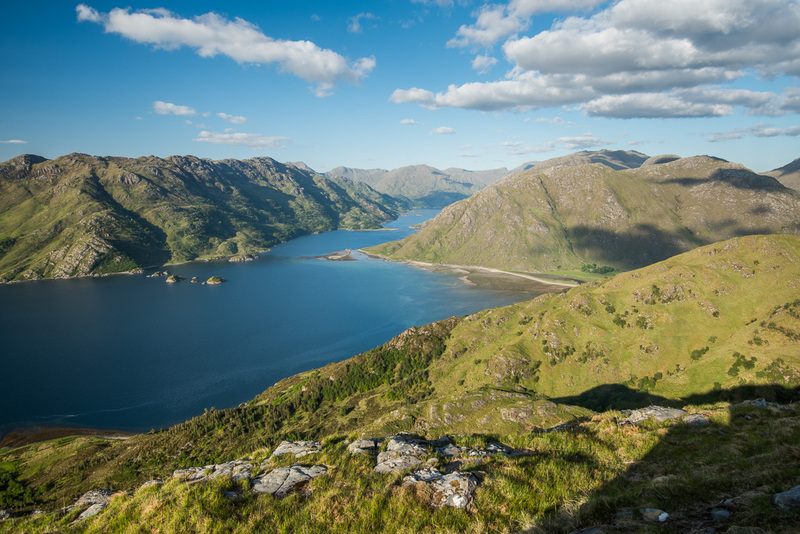 Summer in the Knoydart – Could this view look anymore inviting? I continued up and finally reached the cairn at the summit and was greeted with more stunning views. By around 5pm the clouds closed in, which was a welcome escape from the sun. 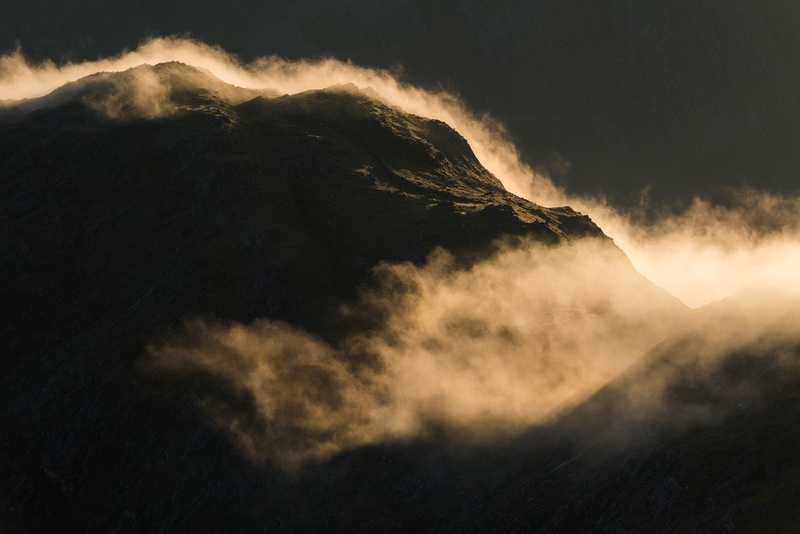 A few breaks in the cloud provided some dramatic lighting as I descended back to Barrisdale. I took the decision to make use of the simple bothy and campsite at Barrisdale where a few other hikers were hiding from the midges. We talked into the night and turned in for the night. Luinne Bheinn towering above Barrisdale. A great mountain to go back for. The clouds overhead cleared not long after sunrise and I took a short walk into a nearby valley to make the most of the morning sun. By that point, the winds had really picked up. 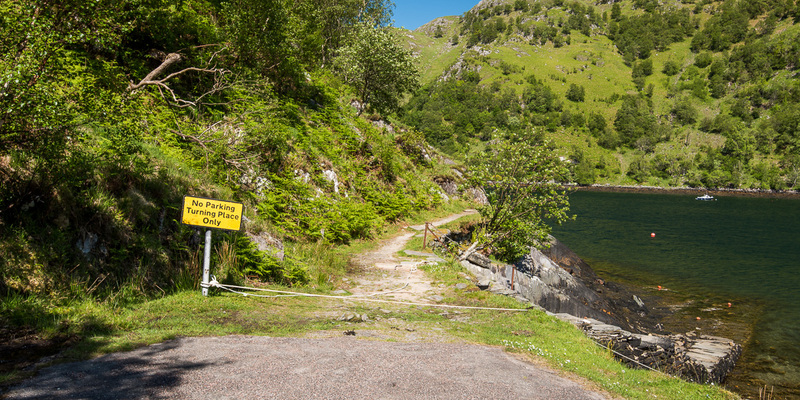 After breakfast, I began the long hike back to Kinloch Hourn. I was accompanied by Steve, another hiker who also happened to be a photographer based in the borders. We shared stories and pushed on through the relentless heat, finally reaching my car by lunchtime. I was well and truly exhausted but pleased with the successes of the trip. Landscape photography is an emotional rollercoaster, and I find it highly additive in that respect. For all the doubts and toil I went through those few hours of photography where more than worth it and the experience, as always, was priceless. Great pics of a lovely area Guy. 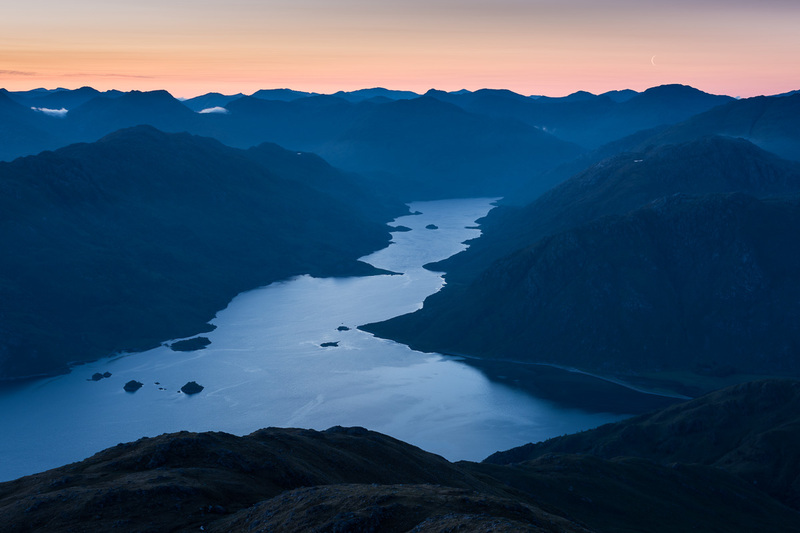 I must get to Ladhar Bheinn sometime, but by water I think. A well advised way of travel but the extra walk did feel more rewarding once I got up there. You can access much of the peninsula by boat which is a great way to see the are. If you’re feeling adventurous the track leading from Inverie to Barrisdale is good enough for small off road vehicles. This is so very professionally compiled. Worthy of a top level award for its excellence. Truly memorable with great set of carefully composed photographs! Great story and commentary, superb photos. 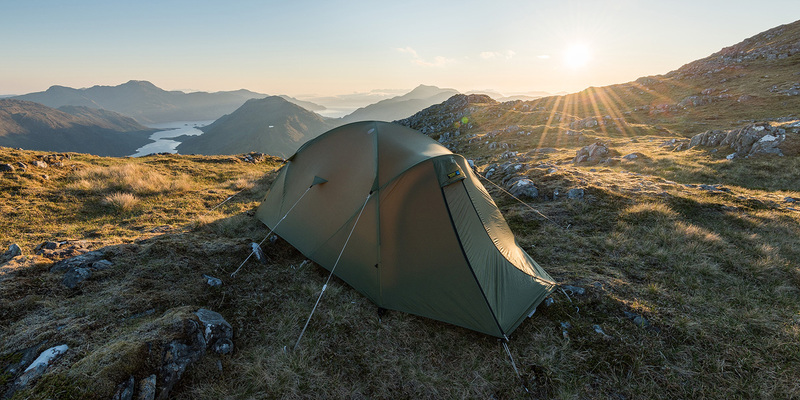 I can empathise with your effort, having ‘humped’ over 25 kilos of camping and photographic gear up the mountains of Glencoe for an overnight wild camp. There was nothing I didn’t use or could have left behind. The pain is temporary and quickly fades, the memories and photos are forever. Very much enjoyed the read! Nice to hear more about the adventure behind the images! Absolutely beautiful! You have just given me the inspiration to get back out there and explore these great isles. This area is definitely going on the list! If you have a few days free it’s very much well worth the visit. You must be fit? Looks like a terrific place to explore. Good looking kit for the camp. I know the weight is always a problem. Great images, they really inspire to go up there. I would be interested to know what lens you chose to take? I suppose May is a good time before the midges? Hi Paul, I try and keep camera equipment to a minimum so I find taking an UWA – 16-35 f4, a 50mm prime (very light and sharp) and a 70-200 f4. These all provide everything I need. May is also a great time, especially as it seems to be one of the driest months too. Absolutely inspirational. I am just searching for a digital SLR not having made many photos since manual got out of fashion. I would love to do a mountain walk with your expertise and guidance preferably in the Lakes if I found a suitable date. Feeling very motivated. Please can we have more of these nice blogs.